You will learn how to care for the dogs, harness and “bootie” them before stepping on the runners and experience the thrill of being on a dog team. At the end of the day Rookies can help with evening feeding and share trail stories over a fine dinner. Retreat location outside of Whitehorse in the Ibex Valley allows for spectacular Northern Lights viewing. Winter gear (jacket, snow pants, warm boots, mitts available. Day One Arrive for 4pm check-in Sunday. Get acquainted with our Off-grid lifestyle, and your accommodations for the week. Settle in for what will be an exciting week of dog-sledding in Canada’s true North. Day Two Enjoy continental breakfast from 7:30 am to 9:00 am in the Main Lodge. Meet your guide and sign out your gear for the week. 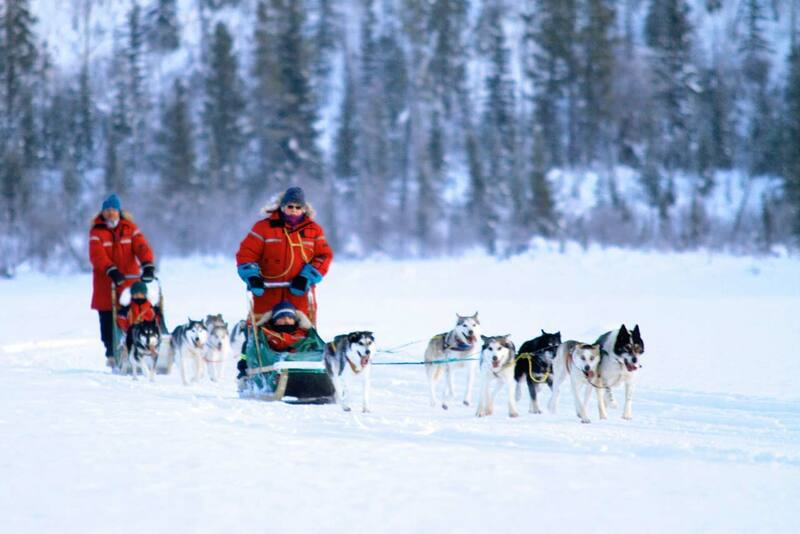 Let’s not waste any more time and introduce you to our family of huskies and your dog-team for your trip. 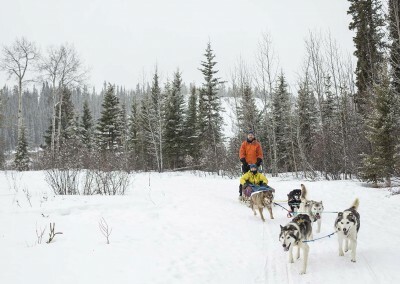 Take a break for lunch followed by your first half day dog sledding trip. Day Three Prepare for another day on the trail, this time a full day trip. Enjoy lunch on the trail around a camp fire. 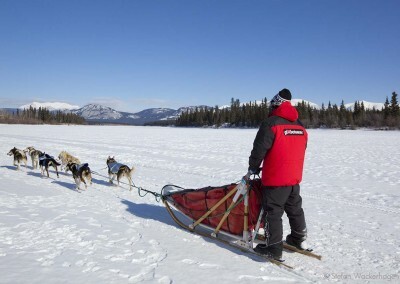 Learn about Klondike Gold Rush history and Muktuk Yukon Quest history and involvement. Share stories and continue to learn about your team and what it takes to motivate one. Day Four There are many other exiting things to do while in the Yukon . In the morning we will visit the Yukon Wildlife preserve and have a chance to look at some of our Yukon wildlife, followed by a soak in the Yukon Hot springs. In the afternoon we will go on a frozen lake and try our luck with ice fishing. Day Five Another full day dog sled adventure on yet another scenic trail. 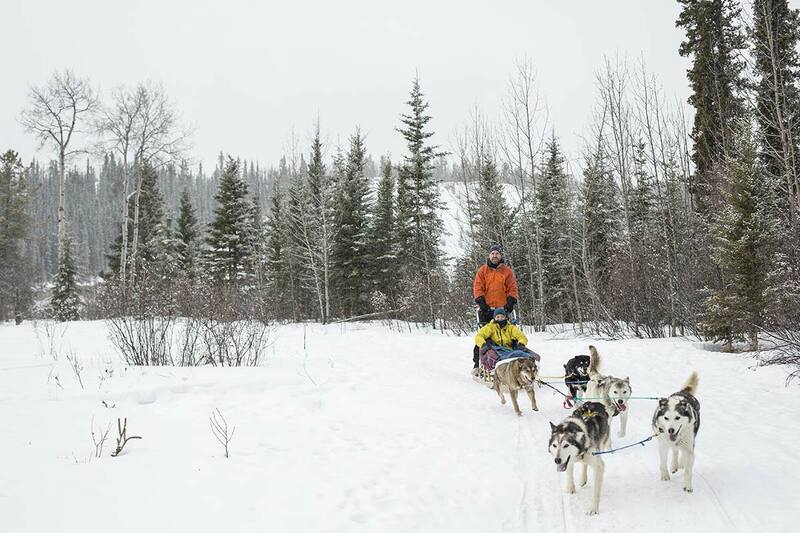 Continue your progress as a musher and develop your bond with your dog team. Day Six After now mushing for several days and developing your skills, we will take you to our technical trails in the bush surrounding Muktuk Adventures. Today is all about working together with your team. Day Seven Give your farewells to the dogs and prepare for checkout 11am. Transfer to the airport or to your hotel in town if you choose to explore Whitehorse a bit longer. Cancellation less than 21 days in advance – no refund In case of cancellation all payments are transferable for up to one year. Adult prices quoted, without GST. Reduced rates available for youth and children. Prices are subject to change. If English isn’t your first language we have guides who speak German and Japanese, and support crew members working with us from other countries who may be able to assist on a tour in your preferred language. Average temperatures at this time of winter are between -2° and – 24° Celsius / 28 to -31 degrees Fahrenheit, but extremes may be as low as -45° Celsius / -50 Fahrenheit. We ask you to bring adequate clothing to withstand these temperatures. You may buy winter clothing in Whitehorse. Due to variables of weather and road conditions and the needs and safety of the dogs and participants, Muktuk Adventures Ltd explicitly reserves the right to adapt the tour itinerary. Changes to the itinerary at the discretion of the guide are possible. Canadian law requires that you sign a ‘release of claims and waiver of liability form’ prior to participating on this trip. Please ensure you invest in travel insurance for your trip.